cars passes Bryn Mawr Avenue. except Foster, Noyes, and Wellington. The Purple Line (or the Evanston Line) of the Chicago Transit Authority is a 3.9-mile (6.3 km) route on the northernmost section of the Chicago "L" rapid transit system. Normally, it extends south from Linden Avenue in Wilmette, passing through Evanston to Howard Street, on Chicago's north side. In 2016, the average weekday boardings on the Purple Line was 10,187. During weekday rush hours, the Purple Line extends another 10.3 miles (16.6 km) south from Howard Street to downtown Chicago running express from Howard Street to Belmont Avenue, with a single stop at Wilson Avenue, and then making all local stops to the Loop. The express service is known as the Purple Line Express. Prior to the color-coding of CTA rail lines in 1993, the Purple Line was known as the Evanston Line, Evanston Service or Evanston Shuttle, and the Purple Line Express was called the Evanston Express. The Purple Line is useful for reaching Northwestern University (Foster and Noyes stops in Evanston), including the sports facilities Ryan Field (stadium), Rocky Miller Park, Welsh-Ryan Arena, and Canal Shores Golf Course all at the Central Street stop and the Bahá'í House of Worship at the Linden stop. The selection of purple as the line's color was likely from Northwestern's official school color being purple. Beginning at Linden Avenue in Wilmette, which contains a small storage yard and car service shop, the Purple Line traverses the North Shore area on private right-of-way which begins at street grade. Running southeasterly from Wilmette, the line rises past Isabella Street on the Wilmette-Evanston border then bridges the North Shore Channel immediately north of Central Street, the first stop in Evanston. The line, now on an elevated embankment, curves southward parallel to Sherman Avenue. Continuing south, the line enters downtown Evanston and stops at Davis Street, then curves southeasterly again to parallel Chicago Avenue and Metra's Union Pacific Railroad right-of-way to Clark Street just north of the CTA's Howard Yard facilities. Here the line crosses through the yard area before the junction with the Red Line and the Yellow Line. The tracks are split on grade separated structures to allow Yellow Line trains to enter the junction from the west. Immediately south of the yard lies the Howard Street terminal, where Red, Purple and Yellow Line trains all terminate. There are four operational tracks starting at Howard Street, continuing on to Armitage Avenue. During weekday rush hours, the Purple Line runs express on the outer tracks, skipping all stops until Wilson Avenue, and then to Belmont Avenue. From Belmont Avenue to Armitage Avenue, the Purple Line and Brown Line share the outside tracks and both make all stops along the route. From just south of Armitage Avenue to just north of Chicago Avenue, they are on a two track line on a 4-track structure. After the North Shore Line ceased operations in 1963, the outer tracks in this area were rarely used and received next to no maintenance; they were permanently taken out of service in 1976. The northwestern corner of the loop, through which the Purple Line enters and exits. The original routing of the Purple Line Express is clockwise around the Inner Loop track via Lake-Wabash-Van Buren-Wells, making all Loop stops before returning to Merchandise Mart and making all stops northbound to Linden. Beginning April 2, 2007, the Purple Line Express was rerouted onto the Outer Loop track along with the Brown Line due to the construction at the Belmont and Fullerton stations (see below). Prior to this, Purple Line Express trains were occasionally diverted to the Outer Loop track in the event of emergencies or signal problems in the Loop. On December 4, 2008, the CTA announced that the Purple Line Express would return to the original Inner Loop routing on December 29. If a problem occurs between the Loop and the Fullerton station, the Purple Line is generally routed into the subway, following the Red Line to Roosevelt Road before returning north. 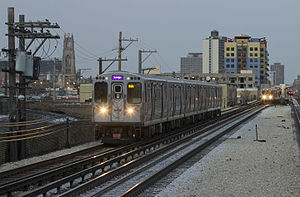 For several years, inbound afternoon Purple Line Express trains stopped at Addison Street on the Red Line before weekday evening Chicago Cubs baseball games, in order to provide direct service to Wrigley Field for passengers from northern Chicago, Evanston and Skokie. However, trains had to cross over to the inner Red Line tracks, as there is no platform access to the outer tracks at Addison. As a result of the Brown Line construction and in effort to minimize delays, trains now stop one station north at Sheridan Road before evening Cubs games. The station was constructed with two island platforms that can access the express tracks, eliminating the need for trains to switch over. During its weekday rush hour route, the Purple Line Express is one of only two 'L' lines to have transfers to every other line, the other being the Red Line. The Purple Line stations at Davis and Main are immediately to the east of their Metra counterparts, while the Washington/Wells, Quincy, LaSalle/Van Buren and Washington/Wabash stations on the express leg are within walking distance of Metra trains at Ogilvie Transportation Center, Union Station, LaSalle Street Station and Millennium Station, respectively. The Purple Line is operated with the Bombardier-built 5000-series railcars. Until late May 2014, the 2400-series cars were also assigned to the line; for the entire 2000s and early 2010s, the Purple Line fleet consisted entirely, or nearly entirely of 2400-series cars. In spring 2007, small numbers of 3200-series railcars were transferred to the line, replacing the 2600-series railcars transferred to other lines, the 3200-series cars have since been returned to their original line assignments. The 2600-series cars were officially assigned to the line until early January 2013 when they were transferred to the Red and Blue Lines. However, beginning in October 2013, CTA has started to reassign the 2600-series cars back to the line as they get displaced by the new Bombardier-built 5000-series cars on the Red Line. Beginning in April 2014, CTA has started to assign some Bombardier-built 5000-series cars to the line. On May 21, 2014, the last 2400-series cars were removed from service from the line. The 2600-series cars were removed from service from the line on March 21, 2015. The Purple Line run with six cars during weekday rush hours and four cars at other times on weekdays and all day on weekends. Occasionally, the Purple Line borrows cars from the Red Line when short on cars. The Purple Line operates full-time between Linden and Howard from Mondays to Thursdays from 4:25 a.m. to 1:30 a.m., Fridays from 4:30 a.m. to 2:10 a.m., Saturdays from 5:05 a.m. to 2:15 a.m. and Sundays from 6:05 a.m. to 1:45 a.m. On weekdays, frequencies range from five to eight minutes during rush hours, ten minutes during middays, then 12 to 15 minutes during the evening and 20 minutes after midnight. On weekdays, service operates every 15 minutes early morning and night, 12 minutes middays and late afternoons. The Purple Line Express operates rush hour service between Linden and the Loop on weekdays only from 5:15 to 10:05 a.m., and resumes from 2:25 to 7:05 p.m., with headways of five to eight minutes (with wider headways of 15 minutes possible). The Evanston Line was placed in operation on May 16, 1908 between Central Street, Evanston and the Loop when the former Northwestern Elevated Railroad extended its mainline service over leased electrified steam railroad trackage owned by the Chicago, Milwaukee, St. Paul and Pacific Railroad. On April 2, 1912, the line reached its present-day terminal at Linden Avenue, Wilmette. The new terminal was established without permission of Wilmette residents, who feared rail service would encourage construction of large apartment buildings in the affluent community. In 1922, the surface level section of the North Side 'L' was elevated onto a concrete embankment structure between Leland Avenue and Howard Street and was expanded from two to four tracks, allowing complete express service from Wilmette and Evanston to downtown Chicago. Several segments of the Evanston Branch itself ran at street level until 1928, when it was elevated onto a concrete embankment between Church Street and the North Shore Channel. It was placed in operation on January 29, 1928. Nine stations existed after Howard, including a station at Calvary. That station closed in 1931 and replaced by a new station at South Boulevard to the north. The Brown and Purple Chicago 'L' lines run above vehicle traffic on Franklin Street in the Near North Side community area. The current service which was to become the Purple Line went into effect on July 31, 1949, after a massive service reorientation on the North–South rapid transit system by the still infant Chicago Transit Authority. Local service was restricted between Linden Avenue and Howard Street, operating at all times. The express service ran weekday rush hours only, stopping at all stations, Howard, Morse (formerly Rogers Park), Loyola, Wilson, Chicago, Merchandise Mart and all Loop stations. While skip-stop service was also introduced at this time, Evanston trains continued to make all stops at their stations. An express surcharge was also instituted for customers traveling to and from the Loop past Howard. Several attempts were made to reduce or eliminate the fare, backed by local politicians. Right-of-way and trackage used by the Evanston Branch and the North–South Route (today's Red Line) between Leland Avenue and the Wilmette terminal was purchased by the CTA in 1953 from the Chicago, Milwaukee, St. Paul and Pacific Railroad. In turn, the railroad received $7 million USD in CTA revenue bonds. Midday and Saturday Loop Express service was discontinued in the 1950s and the local shuttle service began using one-man operations with single unit cars in the 1960s. On July 16, 1973, the Isabella station closed, bringing the total number of stations on the Evanston branch to eight. On November 8, 1973, the third rail system was installed on the Evanston Branch between South Boulevard in Evanston and the Wilmette terminal. Prior to this, Evanston shuttle trains had to be equipped with trolley poles and power collected through overhead catenary wires (similar to the Yellow Line before its conversion to third rail in 2004). The conversion to third rail allowed the CTA to retire the 4000-Series, which were nearly 50 years old and put newer cars on the line. Since parts of the line are at grade level, some community members initially resisted the conversion and worried the proximity of the rail would be hazardous. By the end of 1976, the additional stops after Howard were eliminated and the Evanston Express ran nonstop between Howard and Merchandise Mart. The CTA cited complaints about delays in service due to the extra stops as justification for their removal. However, on January 20, 1989, express trains once more began making additional stops outside the Loop, at the Belmont and Fullerton stations, in order to relieve overcrowding on the rapidly growing Ravenswood (later Brown) Line. By the end of the 1990s, trains would make all stops between Belmont and the Loop. The express surcharge was eventually dropped in 1997 as an incentive for customers to use the new TransitCard system. The overnight "owl service" was eliminated during a service purge by the CTA on April 26, 1998. However, the hours of express operation were expanded on December 16, 2001, for a 180-day trial period. Trains departed Linden for downtown one hour earlier in the morning rush and one hour later in the evening rush. The expanded hours were later made permanent and in 2004 afternoon rush service was also revised to begin 25 minutes earlier. In 2005, the CTA embarked on a project to replace six deteriorating viaducts on the Evanston branch of the Purple Line. The poor condition of the century old viaducts forced the implementation of permanent slow zones and were a point of contention for many Evanston politicians. They claimed CTA had secured funds and promised to begin replacing the viaducts starting in 1999, but had diverted the funds to other projects. The CTA responded that it only provided projected uses and had not committed the money to any specific purpose. The Main Street viaduct was completely replaced over the weekend of November 12–13, 2005, requiring the temporary shutdown of the Purple Line. Construction was completed by the Monday morning rush hour. The Church Street viaduct was replaced next; preliminary work at that location began in July 2006 and the new viaduct was installed in late October 2006 during another weekend closure of the Purple Line. The Purple Line's Howard terminal underwent a major renovation from 2006 until 2009, during that time it was completely rebuilt and made ADA-accessible. Major work on the station progressed throughout 2007, causing temporary platform boarding changes, typically on the weekends. The express service has often been targeted for elimination during service purges due to its "auxiliary" nature compared to other CTA rail lines, the rationalization being that there are readily available, albeit slower, alternatives along its entire route. One of the first moves at halting express service came in 1973 while one of the most recent was in 2005, when threatened service cuts included the Purple Line Express. The CTA budget crisis continued into 2007 and the Purple Line Express was once again selected as one of several routes to be eliminated if additional funding was not provided. The suggested service cuts would have taken effect September 17, 2007. However, the final plan retained the downtown service, making the stop at the Sheridan station permanent to supplement the Red Line and provide additional capacity on the system following the elimination of thirty-nine bus routes. Express operation would be a day-to-day decision; if the Red Line was too crowded, Purple Line Express trains would make all local stops between Howard and Belmont, resuming the regular route at that station. The service cuts were scheduled to be implemented on September 16, 2007, but the CTA received a last-minute $24 million advance on its 2008 operating subsidy, postponing the changes until November 4, 2007. A last-minute $21 million grant from the governor once again postponed the changes to January 20, 2008, this time including the elimination of 42 additional routes. However, the Illinois Legislature successfully passed HB656, a transit funding package, on January 17, 2008, providing the CTA with sufficient operating funds and preventing the service cuts. The CTA also embarked on a $530 million USD project to rehabilitate and replace stations and infrastructure along the Brown Line. This project was completed in December 2009. Seven of the stations that were included in the project are shared with the Purple Line, along with the associated trackage and signals from north of the Belmont station to the Loop. Beginning April 2, 2007, operation on the Purple, Brown and Red Lines between Addison and Armitage was restricted to three tracks, down from the previous four, due to construction at the Fullerton and Belmont stations. Because of this, fewer trains operated to downtown during the rush period in order to prevent a bottleneck. Only every other train was sent to the Loop during rush periods; all other trains operated between Linden and Howard only. Full service has since been restored. In addition, the Purple Line Express routing was changed to the Outer Loop, rather than along the Inner Loop, in order to provide riders more options for accessing stations between Belmont and the Loop. This line was returned to the Inner Loop in Spring 2009. One form of the CTA's Circle Line plan would call for a rerouting of the Purple Line Express service. Rather than continue to the Loop along with the Brown Line, trains would follow the Red Line after Belmont, making a stop at Fullerton and all current Red Line subway stops and terminate at a new station on Wentworth before heading north. However, this is merely a study and the final form of the Circle Line and its effects on current CTA rail service, if the project begins at all, remain to be seen. These are the destination signs used by the Purple Line since 1993, when they began displaying the route name on the line color background. Howard destination sign, used on southbound shuttle trains terminating at Howard. Loop destination sign, used on southbound Purple Line Express trains during weekday rush hours. Between Clark/Lake and Washington/Wells, Purple Line Express trains operate clockwise around the Inner Loop. After stopping at Washington/Wells, trains return to Merchandise Mart then make all stops back to Linden. ^ "Annual Ridership Report 2016" (PDF). Chicago Transit Authority. Archived from the original (PDF) on 24 September 2017. Retrieved 22 May 2017. ^ Purple Line. Chicago "L".org. Retrieved on 2006-09-23. ^ Armitage Tower. Chicago "L".org. Retrieved on 2007-08-08. ^ a b c CTA Outlines Plans for Three-Track Operation This Spring. Chicago Transit Authority. 2007-01-10. Retrieved on 2007-01-11. ^ Purple Express Trains to Resume Operating on Inner Loop Track December 29. Chicago Transit Authority. 2008-12-04. Retrieved on 2008-12-05. ^ Rail Service Disruptions Result of Three Unrelated Occurrences. Chicago Transit Authority. 2006-09-28. Retrieved on 2006-12-04. ^ CTA Best Choice for Baseball Fans Traveling to U.S. Cellular and Wrigley Field this Baseball Season. Chicago Transit Authority. 2006-03-21. Retrieved on 2007-01-11. ^ CTA Provides Service to Wrigley Field This Baseball Season. Chicago Transit Authority. 2007-04-05. Retrieved on 2007-05-21. ^ CTA Car Assignments[permanent dead link]. Chicago "L".org. Retrieved on 2007-09-16. ^ 3200-series cars at Linden. Flickr. 2007-07-29. Retrieved on 2007-07-30. ^ "Purple Line Trains schedule" (PDF). Chicago Transit Authority. transitchicago.com. Retrieved June 3, 2018. ^ Borzo, Greg (2007). The Chicago "L". Arcadia Publishing, p. 80. ISBN 0-7385-5100-7. ^ Borzo, Greg (2007). The Chicago "L". Arcadia Publishing, p. 81. ISBN 0-7385-5100-7. ^ Borzo, Greg (2007). The Chicago "L". Arcadia Publishing, p. 84. ISBN 0-7385-5100-7. ^ Calvary. Chicago "L".org. Retrieved on 2006-09-23. ^ "CTA will start new skip-stop service on 'L'; north and south routes affected in plan." Chicago Daily Tribune. 1949-06-30. ^ "CTA passes up cut in express 'L' train fare." Chicago Daily Tribune. 1957-09-06. ^ "CTA will buy 'L' segment and asks bond bids." Chicago Daily Tribune. 1953-10-10. ^ "Rail buys CTA bonds, sells 'L' right of way." Chicago Daily Tribune. 1953-10-17. ^ Isabella. Chicago "L".org. Retrieved on 2006-09-23. ^ "Residents hit CTA hot rail plan." Connie Lauerman. Chicago Tribune. 1973-06-07. ^ "Express 'L' ends stops at 2 stations." Chicago Tribune. 1976-12-09. ^ "Evanston Express adds stops Jan. 20." Chicago Tribune. 1988-11-04. ^ "CTA to drop surcharge with use of new transit card." Jon Hilkevitch. Chicago Tribune. 1997-06-12. ^ "CTA to begin latest cutbacks, reducing its late-night service." Chicago Tribune. 1998-04-26. ^ The CTA announces bus and rail service improvements. Chicago Transit Authority. 2001-10-03. Retrieved on 2006-09-23. ^ CTA announces additional rail service improvements. Chicago Transit Authority. 2004-01-22. Retrieved on 2006-09-23. ^ "Legislators snub CTA over Evanston repairs; rebuilding sought of 6 old viaducts." Courtney Flynn. Chicago Tribune. 2003-06-20. ^ CTA to Install New Steel Viaduct at Main Street this Weekend. Chicago Transit Authority. 2005-11-11. Retrieved on 2006-09-23. ^ CTA Field Work Begins to Replace Church Street Viaduct. Chicago Transit Authority. 2006-07-06. Retrieved on 2006-09-23. ^ CTA to Install New Steel Viaduct at Church Street this Weekend. Chicago Transit Authority. 2006-10-26. Retrieved on 2006-12-04. ^ "Opening of Auxiliary Entrance at Howard Station Completes Station Renovations". CTA website. Chicago Transit Authority. Retrieved August 23, 2010. ^ Howard Station Rehabilitation Construction Work. Chicago Transit Authority. 2007-09-14. Retrieved on 2007-09-16. ^ "CTA cuts 18 bus routes, 23 'L' stations." Tom Buck, Edward Schreiber. Chicago Tribune. 1973-01-16. ^ Chicago Transit Board Selects Reduced Service Plan. Chicago Transit Authority. 2005-04-13 Retrieved on 2006-09-23. ^ CTA Outlines Contingency Plan. Chicago Transit Authority. 2007-05-24. Retrieved on 2007-07-30. ^ Service Reductions and Fare Increases Effective September 16, 2007. Chicago Transit Authority. 2007-09-03 Retrieved on 2007-09-15. ^ CTA Board Approves Modified Contingency Plan. Chicago Transit Authority. 2007-08-08. Retrieved on 2007-08-08. ^ CTA Statement on Postponing Service Reductions and Fare Increases. Chicago Transit Authority. 2007-09-14 Retrieved on 2007-09-15. ^ CTA Postpones Service Cuts, Fare Increases and Employee Layoffs Scheduled for November 4. Chicago Transit Authority. 2007-11-02 Retrieved on 2008-02-27. ^ Service Reductions and Fare Increases due to Insufficient State Funding. Chicago Transit Authority. 2008-01-07 Retrieved on 2008-02-27. ^ CTA Statement Regarding Passage of Transit Funding Legislation. Chicago Transit Authority. 2008-01-17 Retrieved on 2008-02-27. ^ Countdown to a New Brown: The Brown Line Capacity Expansion Project. Chicago Transit Authority. Retrieved on 2010-11-19. ^ Countdown to a New Brown: The Brown Line Capacity Expansion Project. Chicago Transit Authority. Retrieved on 2006-12-04. ^ CTA Track and Signal Renewal Project to Upgrade Red and Brown Line Junction. Chicago Transit Authority. 2006-05-01. Retrieved on 2006-12-04. ^ Linden Purple Line Timetable Archived 2007-07-12 at the Wayback Machine. Chicago Transit Authority. 2007-03-02. Retrieved on 2007-07-30. ^ Linden Purple Line Timetable Archived 2010-05-01 at the Wayback Machine. Chicago Transit Authority. 2010-02-07. Retrieved on 2010-11-19. ^ Loop the Loop - Proposal for new Circle Line. Chicago Transit Authority. Retrieved on 2006-09-23. ^ Train Destination Signs. Chicago "L".org. Retrieved on 2006-12-04. ^ "Red & Purple Line Modernization Alternatives Being Considered". Chicago Transit Authority. Retrieved August 18, 2012. This page was last edited on 17 January 2019, at 12:55 (UTC).